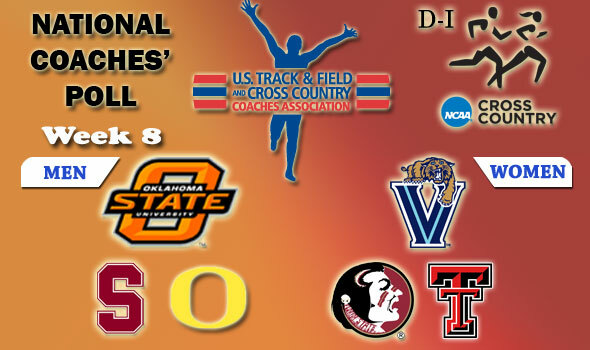 NEW ORLEANS – Today on this Election Day as most of the political world turns more into a split decision, so too does the USTFCCCA National Cross Country Coaches’ Poll in Division I. In a takeover in sorts, Oklahoma State’s men moved ahead of Stanford and are now the No. 1 team in the country after a thrilling conference championship weekend. Meanwhile as some things remain the same, Villanova is still in the top spot as they have all season in the women’s poll. MEN: All it took was for one vote to change in the coaches’ poll, but it was enough to send Oklahoma State to No. 1 in the nation, for the first time in school history. The defending NCAA Champions were voted as high as No. 2 in the 2009 season, but never held the top spot. Going back to 1998, Oklahoma State joins Stanford, Wisconsin, Arkansas, Oregon, and Colorado as the only teams to hold a number one ranking. The Cowboys won their third-straight Big 12 title on Saturday as Girma Mecheso, German Fernandez, Colby Lowe, and Tom Farrell claimed the top four spots in the league meet. Joseph Manilafasha was ninth individually for OSU, allowing the Cowboys to score just 19 points to runner-up and No. 9 Colorado’s 46. No. 2 Stanford was nearly as dominant in winning their second-straight Pac-10 title. Scoring just 25 points to No. 3 Oregon’s 56, the Cardinal crew of Elliott Heath, Jake Riley, Chris Derrick went 1-2-3, mirroring a similar finish posted at the Pre-National Invitational earlier in the season. Miles Unterreiner, J.T. Sullivan, Erik Olsen tallied the 9-10-11 spots in the order. Iona, staying at No. 4, won their 20th-consective MAAC crown on Saturday while No. 5 Wisconsin made it 12 straight in the Big Ten. The Badgers, with just 28 points at their home course, had no trouble holding off No. 12 Indiana. Wisconsin is back in the national top five since September of last season. Moving up two spots to No. 6, Florida State was much relieved to have finally won their first ACC crown. Having been in the league since 2004, the crown has been elusive for the Seminoles, but with a 43-81 victory over No. 16 NC State and placing the five scores in the top 15, FSU topped the podium. No. 18 North Carolina continues their accent up the national ranks. Up seven spots this week, the Tar Heels, who had only previously received votes in the national poll’s history, was third at the ACC meet with 84 points, shaking off No. 21 Virginia (92) and No. 23 Duke (93). At No. 19 and No. 20, William and Mary and Louisville have reached season highs in the poll. The Tribe won their 11th-straight CAA crown on Saturday while the Cardinals (63) were runners-up in the Big East to No. 14 Syracuse (59) by just four points. Louisville’s 3-4-5 scorers held off the charge from those from No. 28 Providence (84) and No. 29 Villanova (85). Not to be ignored, No. 13 Portland won their 32nd-conscutive West Coast Conference crown in Belmont, Calif., this previous weekend. The Pilots won by just seven points over San Francisco for the epic title. What will be interesting in 2011 is the arrival of No. 15 BYU to the conference’s cross country scene. The Cougars (53) placed runner-up to No. 10 New Mexico (40) in their final Mountain West Championship and was led by junior Miles Batty. In the conference rundown, the Big East and ACC each have five institutions in the top 30 while the Big Ten places four. The Pac-10 and Big 12 each have three among the nation’s best. WOMEN: Villanova remains the national No. 1 and this week goes back to unanimous frontrunner status. The Wildcats won their third-straight Big East title last weekend and became the first since Providence in 1995 to 1997 to win three straight league titles. Villanova placed their five scorers in the top 11 to thwart a challenge by No. 5 Georgetown who placed second. Florida State moved up a spot to No. 2 in the nation after claiming another ACC crown. At No. 3, Texas Tech reaches the national top three for the first time in school history – all this coming after seizing their third-straight Big 12 title from No. 8 Colorado. Stanford moved up five spots to No. 4 after claiming their first Pac-10 title since 2007. In what was the closest team finish in league history, the Cardinal scored 62 points for the crown to No. 6 Arizona’s 65 and No. 7 Oregon and No. 11 Washington’s 68. The Cardinal is in the top five for the first time since September 30, 2008. The Virginia squad halved their previous poll ranking in moving from No. 24 to their current notch at No. 12. The Cavaliers placed second at the ACC Championships, recording their best conference finish since 1993. At No. 18, Michigan has reached their highest ranking of the season. The Wolverines came second at the hotly-contested Big Ten meet, scoring 88 points to conference champion and No. 16 Michigan State’s 74. The Spartans won their first league title since 2001 and their winning score was the highest in Big Ten history to claim the crown. No. 23 Oklahoma State is enjoying their highest place on the poll since 2006 and No. 30 Toledo is in the national coaches’ top 30 for the first time since October 13, 2003. The ACC has six squads in the top 30 while the Pac-10 and Big 12 have five apiece. The Big Ten and Big East have four institutions ranked this week. Next week is a scheduled “repeat” week in the national poll in advance of the upcoming NCAA Regional Championship weekend to be held November 13. The final regular season poll will be announced on November 16 before the NCAA Division I Cross Country Championships to be held on Monday, November 22 in Terre Haute, Ind. 1 Oklahoma State (7) 355 Midwest Big 12 Stillwater, Okla.
2 Stanford (5) 353 West Pac-10 Palo Alto, Calif.
3 Oregon 326 West Pac-10 Eugene, Ore.
4 Iona 318 Northeast Metro Atlantic New Rochelle, N.Y.
5 Wisconsin 305 Great Lakes Big Ten Madison, Wis.
6 Florida State 286 South ACC Tallahassee, Fla.
7 Northern Arizona 263 Mountain Big Sky Flagstaff, Ariz.
8 Oklahoma 258 Midwest Big 12 Norman, Okla.
9 Colorado 255 Mountain Big 12 Boulder, Colo.
10 New Mexico 253 Mountain Mountain West Albuquerque, N.M.
11 Arkansas 249 South Central SEC Fayetteville, Ark. 12 Indiana 245 Great Lakes Big Ten Bloomington, Ind. 13 Portland 212 West West Coast Portland, Ore.
14 Syracuse 204 Northeast BIG EAST Syracuse, N.Y.
16 NC State 187 Southeast ACC Raleigh, N.C.
17 Princeton 181 Mid-Atlantic Ivy League Princeton, N.J.
18 North Carolina 141 Southeast ACC Chapel Hill, N.C.
19 William and Mary 134 Southeast CAA Williamsburg, Va.
20 Louisville 119 Southeast BIG EAST Louisville, Ky.
21 Virginia 109 Southeast ACC Charlottesville, Va.
22 California 107 West Pac-10 Berkeley, Calif.
23 Duke 79 Southeast ACC Durham, N.C.
24 Minnesota 72 Midwest Big Ten Minneapolis, Minn.
25 Alabama 70 South SEC Tuscaloosa, Ala.
26 Penn State 66 Mid-Atlantic Big Ten State College, Pa.
27 Tulsa 44 Midwest Conference USA Tulsa, Okla.
28 Providence 42 Northeast BIG EAST Providence, R.I.
29 Villanova 37 Mid-Atlantic BIG EAST Villanova, Pa.
30 Notre Dame 25 Great Lakes BIG EAST South Bend, Ind. Others Receiving Votes: Florida 24, Texas 12, Dartmouth 11, Michigan State 10, Georgetown 9, UCLA 7, Ohio State 3, Montana State 1. 1 Villanova (12) 360 Mid-Atlantic BIG EAST Villanova, Pa.
2 Florida State 338 South ACC Tallahassee, Fla.
4 Stanford 323 West Pac-10 Palo Alto, Calif.
5 Georgetown 314 Mid-Atlantic BIG EAST Washington, D.C.
6 Arizona 306 West Pac-10 Tucson, Ariz.
7 Oregon 295 West Pac-10 Eugene, Ore.
8 Colorado 267 Mountain Big 12 Boulder, Colo.
9 Syracuse 250 Northeast BIG EAST Syracuse, N.Y.
10 New Mexico 240 Mountain Mountain West Albuquerque, N.M.
11 Washington 237 West Pac-10 Seattle, Wash.
12 Virginia 216 Southeast ACC Charlottesville, Va.
14 Providence 205 Northeast BIG EAST Providence, R.I.
15 Stony Brook 192 Northeast America East Stony Brook, N.Y.
16 Michigan State 188 Great Lakes Big Ten East Lansing, Mich.
17 Duke 159 Southeast ACC Durham, N.C.
18 Michigan 147 Great Lakes Big Ten Ann Arbor, Mich.
19 Princeton 140 Mid-Atlantic Ivy League Princeton, N.J.
20 Minnesota 139 Midwest Big Ten Minneapolis, Minn.
21 North Carolina 101 Southeast ACC Chapel Hill, N.C.
22 Boston College 96 Northeast ACC Chestnut Hill, Mass. 23 Oklahoma State 89 Midwest Big 12 Stillwater, Okla.
24 Tulsa 86 Midwest Conference USA Tulsa, Okla.
26 California 60 West Pac-10 Berkeley, Calif.
27 San Francisco 56 West West Coast San Francisco, Calif.
28 Penn State 48 Mid-Atlantic Big Ten State College, Pa.
29 NC State 39 Southeast ACC Raleigh, N.C.
Others Receiving Votes: Indiana 20, Florida 10, Arkansas 4, Colorado State 2, BYU 1, Ohio State 1. Dropped Out: No. 29 Indiana, No. 30 Iowa.